Today marks 12 months since I started up this blog. Thank you to everyone for visiting and forming part of our journey to the sea’s online community. It all started out with an awesome weekend at Stradbroke Island. Click here to read about it, and see the video. Followed by an epic spearfishing trip to Townsville in North Queensland. Click here to see our awesome catch. Then I told you about our desired catamaran, which is still the case. Click here to read about that. Then I reminisced about our favourite place to camp… Up a sand dune. Click here for camping perfection. We checked out the beautiful NSW Coast, South of Sydney. Click here to read about our visit to Wollongong. In the lead up to Christmas we enjoyed the warm weather and watched Santa Claus kitesurfing. We have a video and photos. Click here to see them. When Christmas came along, it brought the beautiful weather which meant we could spend it out on the water. 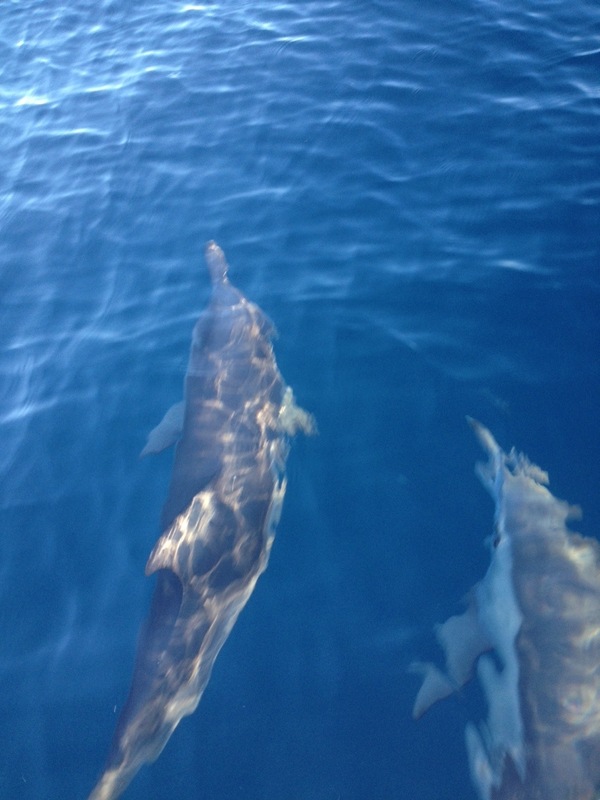 Beautiful sunsets, warm water and playful dolphins all made an appearance. Click here. There is also a video showing the large pod of dolphins. Fingers crossed we have the same weather this year. A friend and I explored the beautiful Sunshine Coast Hinterland. Click here to see what the area has to offer. I discovered the greatest beer batter for fish! Click here for the recipe. We have shared a few other seafood recipes throughout the blog if you’re stuck on ways to cook your fish. Before heading to the snow we made a quick trip to Port Stephens in NSW, on what can only be described as the hottest weekend in history!! Click here to see how beautiful that area is. We then made our way across the world to Switzerland where we went heli skiing, got engaged and experienced some fantastic snow conditions. Our exhilarating heli ski and engagement adventure can be found here. More magical ski conditions can be found here. I then turned tropical and told you all about relaxing in Fiji. For a relaxing holiday idea, click here. I then had a bit of a rant against Sea Shepherd’s anti-spearfishing campaign. If you’re interested in what that’s about, click here. I received new fins and a weight belt for my birthday. They’re pink. Have a look here. They are so good!!! I used those fins during our participation in a spearfishing competition. Read about it here. For some spearfishing inspiration, check out the extra photos here. I became tempted by another type of catamaran, but in the end Catana still remains our first choice. Click here to read about Le Breton Yachts. In June we discovered Kingfish Highway. Came home with a bag full of fish. Click here to see the awesome sashimi I created. Winter brought us a stunning weekend that we spent in Noosa. Paradise is only one click away…. Here. Our friend Michael told us all about his training course for the clipper around the world yacht race. Check it out. We can’t wait to hear about the actual race when it’s his turn on the boat. July brought us some crazy fog, Captain Jack Sparrow style. Have a look here. As well as some awesome waves! Surf on over here to check them out. I took some time out to explain why I love spearfishing so much. If you’re interested, click here. That was just before we saw some of the biggest Spanish mackerel we have ever encountered! August started out with a change of scenery, away from the sea and to the country. If you’re sick of seeing our photos of the ocean, click here to see some of the Australian outback. Things then went quiet for a little while, as we enjoyed everything Samoa had to offer. Click here to find out why Samoa was so heavenly. I then could not stop posting about it, so if you click here you will be taken to all of my posts raving on about how great a place it is.. Except for maybe the food. Then came the best event Brisbane has to offer. Riverfire. A return to the outback this month saw us filling our freezer with venison (which has been delicious by the way). And finally, we found out that life rafts are not everything we expect them to be. Click here to find out about the failed experiment. With many more posts in between, it has been a fantastic year. I hope you will enjoy reading about the next 12 months as much as I have enjoyed writing about the last 12. -probably more cattle mustering, because we make awesome cowpeople. – whatever other adventures life may bring! What was your favourite part of the last 12 months of our journey? ?